"What will you do to make other people smile?" If you have, or know of, children between 5 to 12 years old, have them answer that question above through a drawing and submit their artwork for a worthy cause, which may also win them fantastic prizes! Like many school kids, my boy and girl both love to draw. I think this will be a great exercise for kids' creativity by joining this charitable project spearheaded by Havaianas called Design A Smile (DAS). Kids can draw on the spot and submit their entries at the Havaianas DAS booth during the Mommy Mundo Bazaar on November 24-25 at the Rockwell Tent. As a member of the newly-formed Mommy Mundo SoMoms (which I will blog about very soon), I'm happy to support this cause so I'm sharing with you this wonderful opportunity for your kids to participate and enjoy while you visit the event this weekend. So, what is Design A Smile? 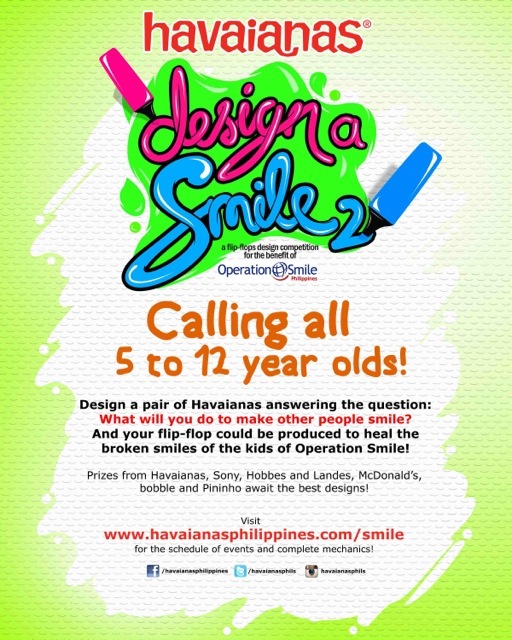 Havaianas Design a Smile is a design competition for the benefit of Operation Smile Philippines, a non-profit organization which provides life-changing surgeries to children with cleft lips and cleft palates. This year's theme is "Paying it Forward: Kids Helping Kids”. Starting this November to January 2013, artistically inclined kids from 5 to 12 years old can join. The design should answer the question “What will you do to make other people smile?” and illustrations should be submitted at partner events nationwide, beginning with the Bonifacio Global City Passion Fest at Bonifacio High Street from November 23 to 25, and at the Mommy Mundo Bazaar at the Rockwell Tent from November 24 to 25. The grand prize winner will have his or her design produced as a limited edition print to be part of the Havaianas 2014 Collection. A percentage of its sales will help fund the operations of Operation Smile. Join this design competition and visit the DAS Booth at Mommy Mundo Bazaar on November 24 and 25, 2012. Like the Havaianas Philippines Official Facebook page to find out other events that the Havaianas Design a Smile 2 booth will be visiting.